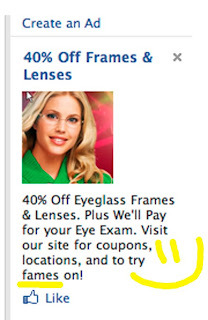 doesn't mean the advertiser shouldn't proof their words. 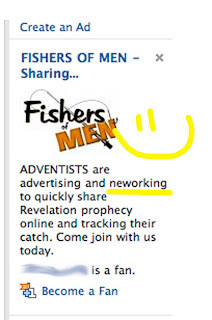 I'm curious as to how exactly the ADVENTISTS are neworking. That must have something to do with Scientology and aliens and Mork from Ork. Nanu Nanu! Shazbut! And we should all be thankful you can try on fame before investing in all it's trappings. 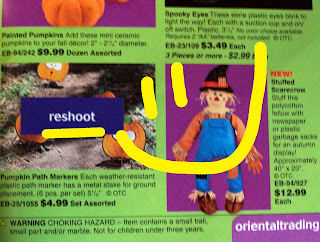 This is one of those "not a Spelling Disaster" things I have to stick on here just 'cause it's funny :) My daughter spotted this in the Oriental Trading Co catalog. Makes you wonder if they ever did reshoot the pic. Really. I do hope I quality!! I could use me some education. And Obama said I should get me some of that qualify education. At least a bunch of the ads on Facebook said Obama said that. 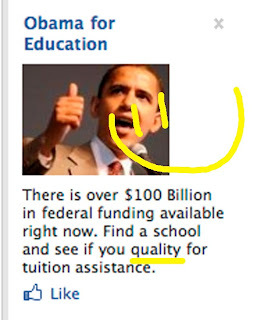 And I have to believe the ads on Facebook because Obama said I have to. We were enjoying live music and a $1.95 pint of Brrr at Caruso's the other evening when this little menu caught my eye. 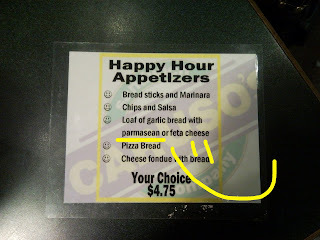 Besides the random capitalization, the cheese choices for the garlic bread put a big smile on my face. :) I completely understand how one could misspell parmesan. Don't our schools teach kids now to sound out words and spell them like they sound? Dictionary.com says it's pronounced pahr-muh-zahn. Some folks though pronounce it par-ma-sean... oh my... that's what the menu says! Parmasean! I'm seeing a trend with Caruso's. First there was spagetti. Now there's parmasean. What's next??? Bred? Soop? Yes, ladies and gentlemen, it's true. 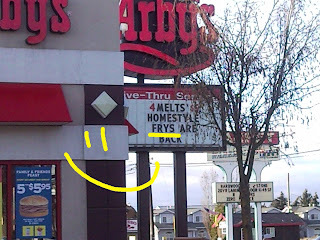 Homestyle Frys are back at Arby's!! I'm so thankful they got rid of the unappealing Homestyle Fries for the infinitely more awesome Frys. 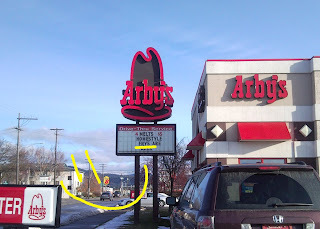 Arby's on Appleway in Coeur d'Alene is located just down the street from the U-Haul place advertising "Resevations". What is it with Appleway??? Megan, who spotted these disasters, suggests the road be renamed Spelling Disaster Way. There was a horrible accident on I-90 Tuesday night involving several vehicles and multiple families/individuals. The 16 year old daughter of the driver who initiated the accident died at the scene. Her friend who was traveling with the family passed away Wednesday. Two other members of another family who were hit head-on are listed in critical condition in other hospitals in the region. 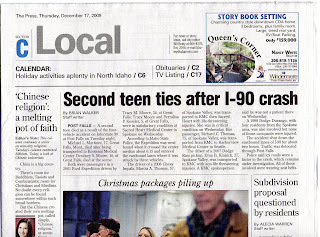 The Coeur d'Alene Press ran the story of the second fatality as the headliner in the "Local" section on Thursday. And they misspelled a key word in the headline. Undoubtably the editors at The Press are feel awful about this mistake, but this highlights a fact of the printed word - there are no take-backs. 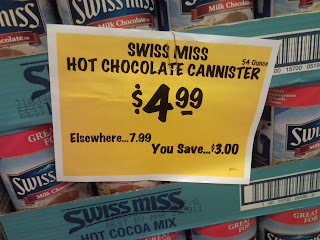 As much I enjoy the laughter a Spelling Disaster can give the day, some spelling disasters shouldn't happen. My thoughts go out to all the families, all the individuals who were affected by this horrible accident. Not only do I love Spelling Disasters that land at my front door, I also love when someone finds a great SD and thinks of me. This disaster landed in my cell phone last night (which is kind of cool since my phone is closer to me than the front door!!) 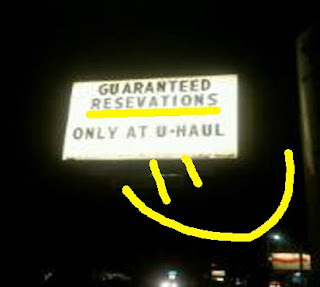 Megan spotted this sign at the U-Haul joint across from Lowe's on Appleway in Coeur d'Alene. She had no resevations in sending it off post haste! Thanks Megan! At least they spelled "Guaranteed" right. 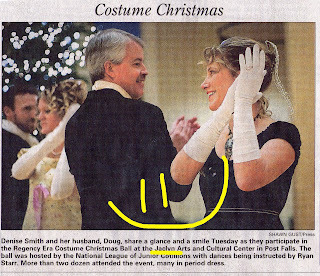 Oh Coeur d'Alene Press... How I love thee!! This Spelling Disaster appeared on the front page of today's paper. I see how easy it would be to misspell "Jacklin Arts and Cultural Center". It's not like the Jacklin family is prominent in the area or anything. It's not like there's a little company called Jacklin Seed here or anything. It's not like "Jaclyn" is spelled that differently than "Jacklin". Heck, at least they spelled Christmas right. I kind of wonder if this Ball is related at all to the elusive event advertised in this Jacklin Arts and Cultural Center flyer. Hey Hot Rod Cafe! We love your "What's Happening" flyer that tells us about the daily specials: Margarita Monday, Fat Tuesday, Watermelon Wednesday, etc. but we are confused why the flyer features the designer's spec info - "Hot Rod spec-7 two-up-1 10-14-08". Looks like this version of the flyer was created on October 14, 2008 (my sister's birthday BTW). This version was also the 7th try. The management team at Hot Rod must've liked this one since they had it printed up. I hope they let the designer know and paid said designer accordingly. Although, this could be the designer's doing. After 7 specs, I can understand how the designer would be feeling a bit frustrated so was possibly so thrilled to have the sign-off that they forgot to remove the spec info when it went off to the printer. Either way, it's not a Spelling Disaster.... but Spec Disaster is close enough!! What more could a blogger ask for than to have the object of their 90th post delivered right to their door!? And hung on the doorknob with a rubberband, too! The tears of joy were nearly streaming down my face. Nearly. They were competing with the Spelling Disaster Shudders I get when these examples of great literary writing are found. I'm not sure what bugs me most about this door hanger/coupon/ad/flyer/thing. Is it the use of random punctuation? Maybe the miscellaneous tabs? 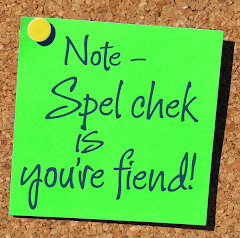 The grammar and spelling goofs? You know, I think it's the whole kit-n-kaboodle! Wonder if Alisha would trade my grahpic desing skills for a couple personal trianer sessions.